To steal a quote, stumbled upon while browsing the net, “Life is like a roll of toilet paper. The closer you are to the end, the faster it goes.” After how fast 2009 seemed to blaze by, I think it’s appropriate. I hope the New Year finds you and your loved ones well. It’s a challenge to go to a place as widely photographed as Yosemite and come back with fresh images. The challenge isn’t the availability of the subjects as much as learning to see them. Once seen, the next step is figuring out how to make it into an image. On New Year’s day morning, I did what I often do when presented with overcast skies, I went to Bridal Veil fall. Bridal Veil is one of the few waterfalls in Yosemite that flows all year. While the water fall is a beautiful sight, most of the photographic opportunities are in the three streams flowing out from its base. Often requiring scrambling over rocks, you can be completely alone while the tourists stream up the path to the viewing area at base of the fall. What caught my eye here was the foam on the top of the water. Directly above my location was a small cascade that was creating these bubbles on the surface of the water. Caught on a long exposure, I knew they would imply motion. The trick was finding something else to put in the frame. I walked around the area, doing my best to keep from falling in, looking through my camera to find a scene. (When shooting in the area, my Canon 100-400 is my most useful tool. Using a long lens helps compress perspective and lets you “carve” out scenes and make them stand alone.) After finding this leaf, I knew I had my shot. While seemingly simple enough it took 10 frames, at varying exposures, to get this pleasing pattern. I settled on f/16 and 3.2 seconds. Finding a scene like this is far more satisfying than creating it. While I didn’t place this leave, in the spirit of full disclosure, I did wash away some foam stuck to the near side of the rock. I almost never place a subject but I have no issue with removing a distraction. While something that could easily have been taken care of during processing I prefer to do it in the field. 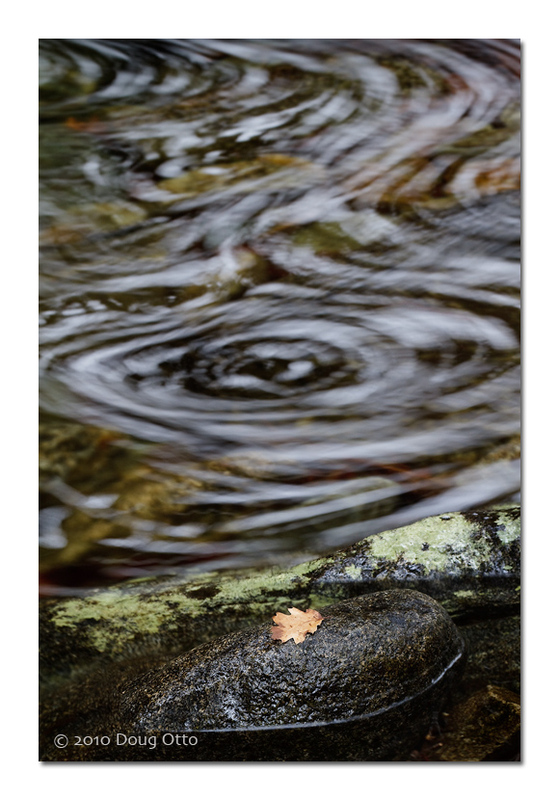 This entry was posted in Photography and tagged bridal veil creek, Canon 100-400, Canon 7D, doug otto, granite, leaves, motion, Photography, winter, yosemite, yosemite national park. Bookmark the permalink.